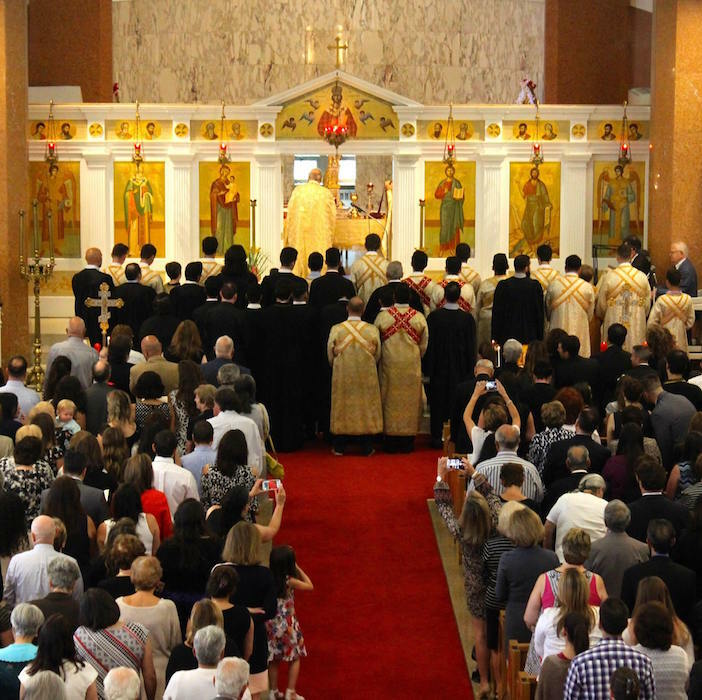 Metropolitan Methodios, head of the Greek Orthodox Metropolis of Boston, has some explaining to do to thousands of faithful at one local parish, where a popular priest was ousted with just three days&apos; notice. Fr. Nicholas Kastanas has led the St. Athanasius Parish in Arlington uninterrupted for almost three decades. According to parishioners with whom we spoke, he built the church into one of the largest and most vibrant in the Boston area with almost 1,000 steward paying families participating in services and activities on a regular basis. According to a letter that was posted on the parish website on July 27, 2017, the community and Fr. Nick himself, were notified that he was being relieved of his duties. The same letter stated that his last Divine Liturgy at the parish where he married, baptized and buried thousands over three decades would take place only three days later on July 30th. “For the past few years, the Saint Athanasius Parish has been in a state of turmoil as a result of issues revolving, in large part, around the person of Fr. 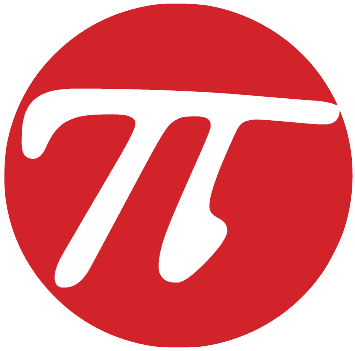 Kastanas,” the Metropolitan wrote. “The spiritual environment in the Community has been severely damaged by behavior that is wholly contrary to Christian values, which has resulted in, among other things, the distribution of hurtful and destructive communications throughout the Community,” the letter said. But words and actions of the community show a different picture. Estimates of almost 2,000 people showed up for church on Sunday for Fr. Nick&apos;s last Divine Liturgy. A Facebook page in support of the priest was quickly mobilized as was a petition with almost 2,000 signatories and a Go Fund Me campaign to offer the priest and his family a financial pillow of support since Kastanas was not given a new assignment by the Metropolis. 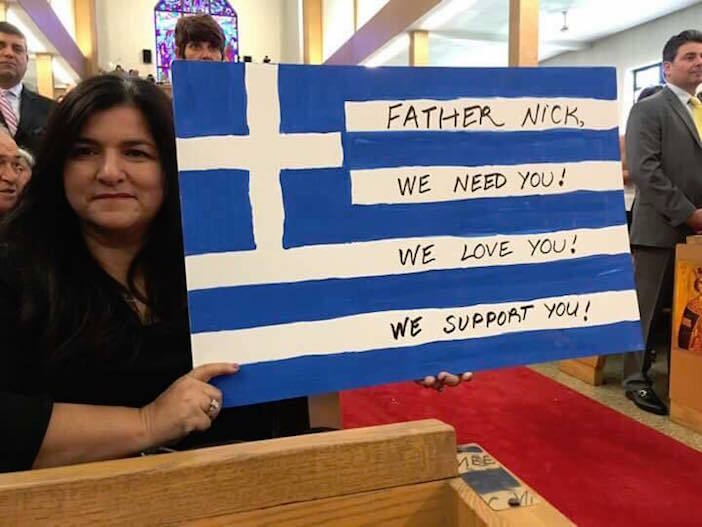 "The people have spoken," Irina Kapetanakis said, who travels from New Jersey twice a month to attend services at St. Athanasius with her four-year old son. She added that "this is not a divided community. More than a thousand people showed up, united in support for our beloved Fr. Nick and to send a loud message to the Metropolis that we won&apos;t stand for this. We won&apos;t stand for a few powerful people who have the ear of the Metropolitan spreading lies and false statements about Fr. Nick. And not acting with the support of the community." Many were caught off guard by the announcement, which offered no specific examples, evidence or accusations against Kastanas. There were also no general assembly meetings or outreach to the community prior to the abrupt announcement. "The Metropolitan speaks of &apos;Christian love&apos; in his letter to the parish about removing Fr. 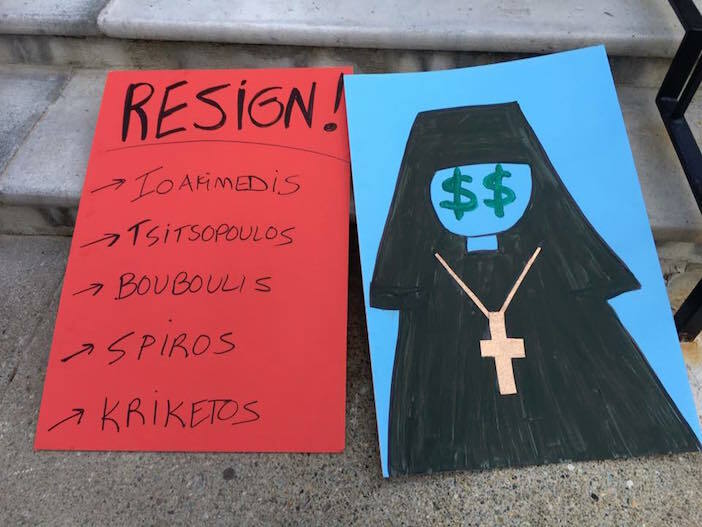 Nick yet he is the one acting exactly the opposite, said Irene Manolopoulos, a parishioner who called Metropolitan Methodios&apos; action "unchristian, inhumane and heavy-handed." "How a human being can do this to another– let alone a spiritual father to a spiritual son– is beyond me and everyone else at the church. The Metropolitan is acting in an unchristian manner, not to mention inhumane. What will Fr. Nick do now? Will he be reassigned?" Manolopoulos said in an email interview with The Pappas Post. Phone calls to the Greek Orthodox Metropolis of Boston went to voicemail. Several people noted that Metropolitan Methodios has been in Greece on vacation and not in Boston to handle the uprising that&apos;s happening at one of his biggest parishes. "It&apos;s cowardly to throw this hand grenade into our parish like this and not be around to handle the fallout, not here to see the tears, the anger and the love and support of Fr. Nick of thousands of his faithful," said Tammy Simeonides, who attended the Sunday services and described the scene as "painful." "The scene on Sunday was both painful and joyous. Dozens of Fr. Nick&apos;s former alter boys came to serve with their spiritual father one last time. This wasn&apos;t a parish in crisis. On the contrary. It was a parish united behind their beloved spiritual father," according to Simeonides. 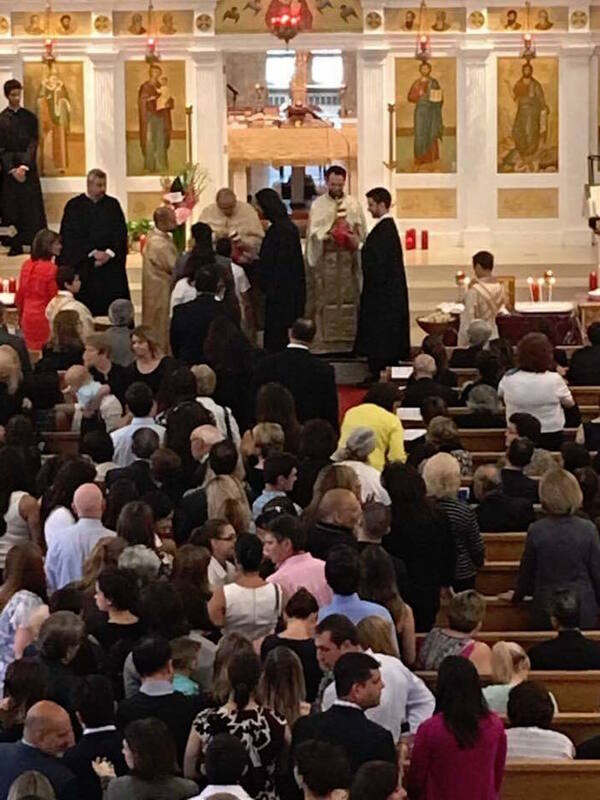 After Divine Liturgy the scenes captured by numerous local media, as well as dozens upon dozens of social media posts by parishioners corroborated these statements. One telling image showed hundreds of faithful lining up for Holy Communion in Fr. Nick&apos;s line while the parish&apos;s assistant priest is waiting alone with the chalice and not a single parishioner approaching. There was also boisterous applause, chanting and the waving of placards in praise of Fr. Nick— highly unusual occurrences if not prohibited– inside Greek Orthodox Churches. Parishioners also showed their power by not lighting candles upon entrance to the church or leaving money in the tray. The traditional passing of the offering basket at the end of liturgy was also cancelled by Fr. Nick himself after an organized protest went viral during which parishioners planned to refuse to give the church their money. An online petition has reached over 2,000 signatures calling on the Metropolis to reinstate the popular priest and a GoFundMe campaign has raised more than $20,000 to support the embattled priest and his family. While the move by Metropolitan Methodios is completely within his rights and powers according to church regulations, countless people we spoke to questioned the heavy-handedness of the Boston-based hierarch and his lack of decency toward not only one of his longest-standing priests, but also to the nearly 1,000 steward families of St. Athanasius Greek Orthodox Church. Methodios doesn’t have to answer his faithful. Bishops in the Greek church— to the shock of many in the United States— have these powers. But some say he will have to answer to a higher power. “Let him look at himself in the mirror every morning, knowing that he’s turned his back and didn’t have the decency to answer more than a thousand people who want answers,” Corina Kapetanakis said. "He may not have to answer to us, but he will have to answer for his actions one day, to God," she said. The Ecumenical Patriarchate of Constantinople MUST be made aware of this absolute disgrace. Got Pope, Need no Bart. The Holy Father gone to Turkey to redeem and consecrate the Greeks, so don’t need no more soviet temples. Don’t need no gyro blimpie Bart when got a regular Pope without the diner attitude. My pop kept hitting momma with a skillet on the head. Friends ended up in the hospital after their pop beat them. Pops got drunk and ruined my first car. Killed two cats and a dog, thrown out the window. Neighbor drowned the canaries in ouzo, lit, ate them. Ma overdid whip so she could give less pie. All our stuff came pilfered, with logos. Greeks overcook all meat so no one knows is bad. Another banned tenants flushing toilet paper. Waiters inpune sanitation because “dirty is natural and healthy.” Priests just answered “behave, respect, tradition!” Now priest comes “no intercommunion!” Where was he when we needed him to protect us from our crazy parents? Don’t sell me “educated Greeks” because we know all them Trojan Horse cheated on the exams. Besides it’s just TV repair school. Remember all those jailed old disco Greeks, tax cheats to “protest” Jerome Ford stopping the Trojan Horse in Chyprious? We can’t get good jobs because no one trusts Greeks, because of Trojan Horse. They always faked reading Greek. That’s why we borrowed regular Catholic books instead of read Greek. Sure, we sacrifice to Greek myths three times a year to please yiayia, and she’s nun the wiser when we go to regular Catholic Mass on Sundays when she bummed from bouzaki dances. Ain’t need no more Bart, just the regular Pope. That’s why we all married regular Catholic when we grew up. So they can trust us. Charlie Patseas you have to be the biggest idiot i have encountered yet. First of all you half a brain, you cannot put a sentence in its form. Then youcomplain about Greek reading. I know shepards that can express themselves in a literal sense.